All Organized and Easy to Follow: For me, its an incredible organizational tool. 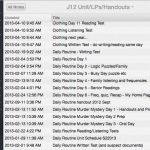 All my units, lesson plans, handouts, audio, video etc in one place. I’m a person who likes to ‘see’ a unit laid out before me and with each lesson labelled “Unit X – Day Y” it gives me a sense of direction. I learned early on to not only organize by day but also to put a brief description of what I cover in the title. 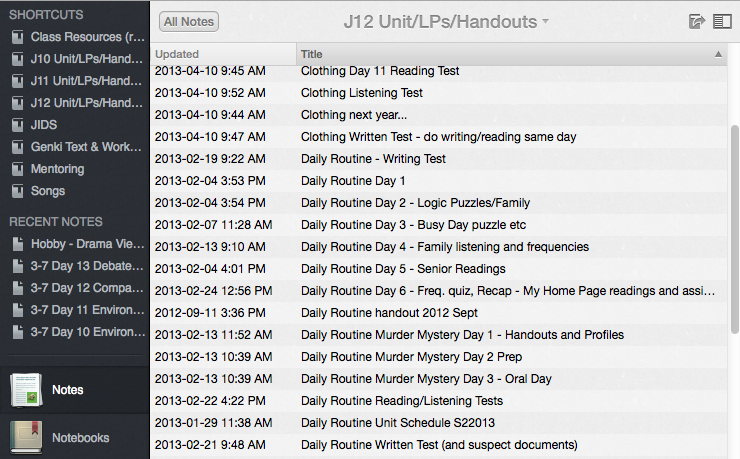 It is easy to see how long a unit typically takes me and what I cover each day. If I deviate from a past lesson I either change the entire note or create an “alternate” lesson note for that day. Cross-platform and Multiple Device access: To me this is the huge advantage for trying this program. My school has a desktop PC stuck in my classroom and I use my personal MacBook Pro for my lessons etc. With Evernote I can take audio of class activities and photos of my boards etc and upload directly to the appropriate note from my iPhone using the app. 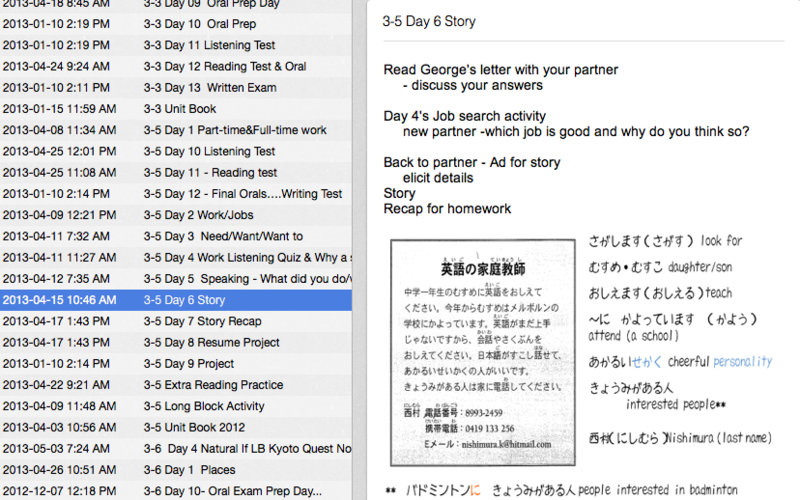 I can preview lessons from home using my laptop and transfer files created on my school PC directly via Evernote Web. Of course it’s equally handy to use to grab files I created ‘on the fly’ for my classes and uploaded via the Web function so they can be stored/backed up using my school server. Tagged Sites Using “Clipper” Add-On: This has been a great tool for me combining my use of Twitter etc with the organizing ease of Evernote. Being able to click on the ‘clipper’ icon on my browser (Firefox for me ) and then tag the site for future reference is so useful. When I finally get my iPad this summer I will be able to search my tags for all of the iPad info I have found along the way. Tagging sites has meant they are much easier to find and actually use. 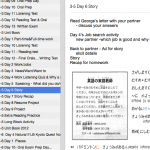 My Two Wishes: While it may seem to be counter to my paperless purpose – I would like to be able to print out a unit ‘plan’ in the form of all the lessons (notes) for that unit. I have yet to try merging them all and printing but wouldn’t it be easier just to be able to highlight several notes and hit “print”? My other wish would be to be able to put the items in the note where I want them – not where either my cursor is or Evernote wants them to be. 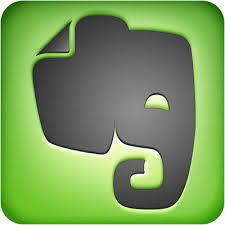 I don’t use Evernote with my students at this point (School District issues of privacy etc. there) but I’m sure that ‘s where I am headed next. Meanwhile if you know of a way to print those multiple notes…let me know! My district is moving towards 1:1 in 2014-15 school year, so I got the iPad mini to play with for summer and hopefully beyond. My first problem was lack of Web Clipper. So, after a quick search, I found this solution http://mergy.org/2012/05/use-the-evernote-clipper-with-safari-on-ipad-and-iphone/ . It seems to work so much better than copy and paste or e-mail to your Evernote kind of thing for clipping on the go. Oh it was soooo messy when I started. If you look back at my other Evernote postings you can see the ‘evolution’ – if you can’t find them let me know and I’ll mail them to you. Basically the version you see is after I taught the course a 2nd time and went in and cleaned it all up! That said I still map my units out manually on the calendar to make sure I don’t hit holidays etc. !